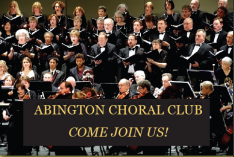 Abington Choral Club is celebrating our 70th season this spring! Our spring concert will showcase some of our favorite music sung by current and former singers alike. To add to the excitement, we will be joining the Philadelphia Sinfonia for a performance at Kimmel Center’s Verizon Hall! Sing With Us! Click for more information. If you would like to sing with us, please click here for audition information.